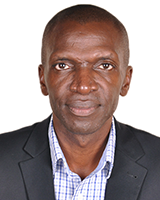 Richard is a Senior Lecturer at Makerere University, trainer, facilitator and researcher, is passionate about gender integration. His work involves promoting gender equity and learning in a sweet potato through schools project, and he is engaged in an IDRC-funded project assessing the capacity of agricultural researchers to conduct gender-responsive research in Rwanda and Uganda. He guides graduate students’ research in gender and climate change adaptation, and in understanding gendered patterns in farmer decision-making strategies in soil management, bean production and marketing. Previously Richard worked promoting gender with the Grameen Foundation’s Community Knowledge Workers initiative.